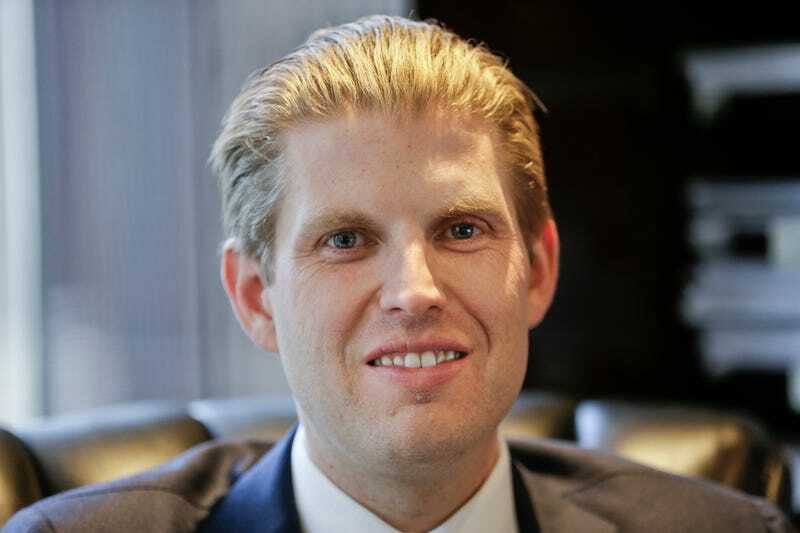 Oh, Eric Trump, ye blonde Grendel. I love that I am getting to see more and more of you these days! I just...love it! Shortly after publicly forgetting the state Mike Pence governs, Eric Trump, in a CNN interview following the vice presidential debate, was pressed to answer the question of whether his father pays federal income taxes. Trump himself has implied that he doesn’t—during the first presidential debate he interjected that not paying federal taxes “makes me smart”—and pages leaked from Trump’s 1995 tax returns suggested that he might have avoided paying federal income taxes for 18 years. Talking Points Memo notes that Eric responded by using the word “tremendous” a total of seven times, explaining, illuminatingly, that “we pay a tremendous amount of taxes,” “my father pays a tremendous amount of tax,” “we pay tremendous taxes,” and so forth. He then revisited the argument that Trump’s tax returns would be released after an alleged audit, which, it’s been well-established, does not actually constitute any sort of obstacle. This does not seem to particularly matter to Eric Trump, who is busy living in a creepy video game loosely modeled after the 1987 film Wall Street where slicked back hair is a professional look, down-time involves shooting cheetahs, and taxes are paid in adjectives.